This recipe is also listed at these wonderful linkup parties - thank you to all the hosts for allowing me to link up! One well-known frugal tip is not to plan your meals and then shop for the ingredients, but the other way around. Fill your stockpile with ingredients bought on sale and with coupons, then figure out what to make with what you have on hand at that moment. But how do you do that? One of my favorite things to do is to use Google as my cookbook! I just type in a few ingredients along with the word "recipe" and voila! a list of possible dishes appears. Then it's just a matter of looking through a few of them, seeing if I want to make it and if I have the other ingredients on hand. Once I find a good recipe, it's time to start cooking! 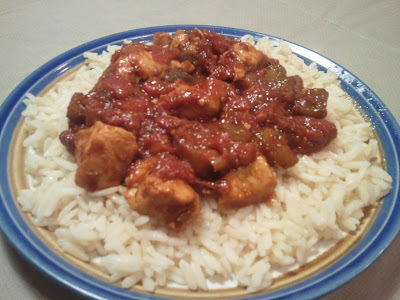 For instance, one night I wanted to make something with chicken, green peppers, celery, and canned tomatoes. I typed in these ingredients and out popped a recipe for Creole Chicken from BigOven.com. It wasn't perfect; it had onions, which I didn't have. But I found a bottle of Worcestershire sauce in the back of my stockpile, as well as a can of tomato paste, an ingredient I rarely use. It was easy to make, and spicy but delicious! I changed the proportions of the ingredients a little and used canned tomatoes with green chilis instead of two separate cans. I thought that the recipe is would be too spicy for my kids, so I sauteed the chicken first and put it aside for them to eat, then made the rest of the meal. In a large skillet over medium heat, heat the canola oil. Add the raw chicken and stir-fry for 5-7 minutes until the chicken is no longer pink inside. Remove the chicken to a plate. Add the celery, green peppers, and garlic to the pan and stir-fry for 3 minutes or until the vegetables are softened. Return the chicken to the pan and add the rest of the ingredients. Turn the heat to high until the sauce is boiling, then turn to medium-low, cover with a pot lid, and simmer for 15-20 minutes. Do you think your recipe could be made in a crockpot? If so how long would you cook it? Diane - sure, I think that would work! I might double the recipe to fill up the crockpot more. If you cook the chicken first in a skillet, it would probably need to cook no more than a couple of hours. If you put raw chicken in with the other ingredients, I would think 6-8 hours on low. Just a guess, I haven't tried it myself. What a fun recipe! Great tip about not shopping for ingredients - that is a costly way to shop! Yum! This meal looks good...that's why I had to click on the link. Thanks for sharing - it really doesn't take long at all to make. That really looks so yummy and perfect with rice.. This is super yummy and it is being featured at the Recipe Box. Thanks for sharing and keep making wonderful dishes, like this.